“There is more to life than just work. Live your life with passion,” says Antonio Tardi from Napoli, Italy, presently the Executive Chef of Shangri-La Hotel, Bengaluru. Antonio is married to a Canadian Citizen Monique and is blessed with two kids Giuliana and Giuseppe. Chef Tardi honed his culinary skills at the prestigious L. De Medici, Ottaviano, Napoli and holds a certification on food service management from Cornell. He gained precious experience at Michelin one- and two-starred restaurants in Italy and France under well-renowned chefs before his career took him to a picturesque resort in Jamaica. He then mastered the Asian style of hospitality at Shangri-La hotels in Taiwan and Guangzhou. Five years ago, when Antonio was working in the Caribbean, a promising opportunity came up with Shangri La Hotels & Resorts to join the team. Shangri-La Hotels and Resorts are definitely one of the most favourite destinations for many people across the globe to rejuvenate them. He started with Chef de Cuisine in Shangri La Hotel, Taiwan, followed by Executive Sous Chef in Shangri La Hotel in Guangzhou, China, and presently, he has been given this wonderful opportunity to launch the culinary operations of soon to launch Shangri-La Hotel, Bengaluru as the Executive Chef of the Hotel. Shangri-La Hotel, Bengaluru will be the group’s first property in south of India with the largest amalgamation of cuisines from various parts of the world offered in eight food and beverage outlets. “With such promising role, my responsibility towards the food aficionados of Bengaluru also increases equally,” he expresses. Chef Antonio Tardi and his team, which is an ensemble of talented chefs from different nationalities and cultures, are looking forward to create memorable culinary experiences for their guests. While working with Shangri-La Far Easter Plaza, Taipei, a place that is surrounded by lush mountainsides, rivers, and wildlife, in the country of Taiwan, the passion for cycling ignited in him. “The love for nature made me love cycling. It allows me to be free and one with the world around me. So, when I was invited to start riding with a colleague from work, I instantly agreed. Five years, and three countries later, I am still going strong,” says Antonio smiling. As cycling took its place in Antonio’s life he happened to make his first milestone as cycling up the Yangmingsan Mountain in Taipei. This trail happened to be very steep and going up to 1120 mts. He also took up official tour ‘Ride for Hope’ which was a Corporate Social Responsibility initiative organized by his previous workplace -Shangri La Hotel in Guangzhou, China. Tour of Nilgiris was his second official tour about which he was acknowledged by his friends with whom he goes riding bicycle at Bangalore. Once registered for TFN, Antonio utilized his spare time to prepare and practise for the ride. This included indoor training on his bicycle and also some core strengthening exercises in the gym. This was the phase of waiting and training post registration just before December 16th, 2014, arrived for the tour to take place. “On my first day, I forgot to put sun block on my arms, legs, face and it turned out to be a hot day. It was evening by the time I reached Mysuru and I was undoubtedly tanned. That tan is still with me!” he recalls. According to Antonio, in addition to skills like power, stamina, and endurance, a cyclist needs a strong motivation, only then can one’s mind be in the game as well. Eating right and healthy along with regular exercise is essential of long tours of cycling like the Tour of Nilgiris which runs of 8 days. Antonio has been using a Giant bicycle since he was in Taiwan, which he believes is good value for money. However, Antonio happened to upgrade some of its features like - using Italian wheels by Campagnolo and other components from Specialised and Silva brands. For him, The Valparrai stage of the tour was one of the highlights. “It was very tough to climb, but I managed to complete it and I am proud of this accomplishment,” says Antonio with pride. He also plans to join TFN 2015 with Tuscany, Italy and Jamaica, Caribbean on his bucket list for this year. Culinary art has been learnt and practised by thousands of people around the world. But for Chef Tardi, ‘it’s not just cooking’. He likes to explore the seasonality of vegetables while seafood tops his favorite dishes. “Designing and preparing good cuisine for me is both an art and a science. The presentation should not only look good, but the experience as it greets your palate should be even more pleasurable,” he believes. Having worked in different parts of the world has not only enhanced Antonio’s culinary skills, but given him an edge to adapt to different cultures and their palates. “City of Bangalore appreciates cuisines from different parts of the world and I am excited to offer unparalleled dining experience to this city,” said Chef Tardi. 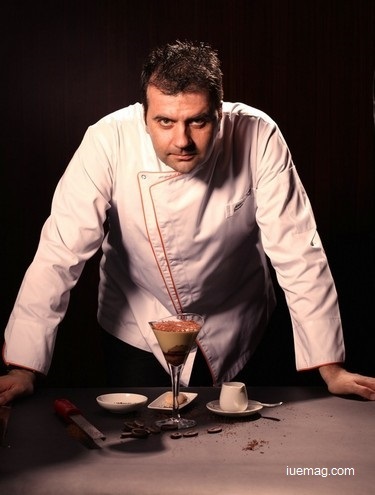 Chef Tardi brings with him over 20 years of culinary experience in five-star hotels and luxury hotels. In addition to his culinary expertise, he is also an outstanding trainer and coach, teaching knowledge and skills to over 100 colleagues to build a strong culinary team at Shangri-La Hotel, Bengaluru.